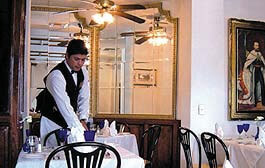 Located in the always popular Romantic Zone, Café Maximilian will transport you to a world of culinary delights. European Chef Andreas Rupprechter combines his extensive experience in Europe and Mexico to create innovative dishes that merge new and old world cuisine. The restaurant also features traditional Austrian dishes. The efficient, genuinely friendly staff help to make this a top spot for fine dining in Puerto Vallarta. Offering terrific food and service, this charming cafe will become one of your favorite restaurants in Puerto Vallarta. World-class Austrian pastries and a selection of rich, freshly ground coffees enhance the meals. Dining is available in the air conditioned dining room as well as at the "very European" sidewalk tables. Open Mon-Sat from 8 am to 11 pm. Closed Sundays. Visa and MasterCard accepted. Reservations recommended. Now you can make your reservation at Kaiser Maximilian online! Just click HERE and confirmation will be sent to you via email. We were on a 7 day cruise and in Puerto Vallarta we took a walk through the city and had lunch at your restaurant. That meal was the best food of our trip. Thank you for your service, which was excellent, and for the marvelous chef. Always a pleasure to eat at Kaiser Maximilian and talk to the friendly staff & owner. Without a doubt the best veal and lamb dishes. A great place to dine relax and people watch. My husband and I truly enjoyed our meal. We were the only one in the section we were seated at and it was quite romantic. We both had steak and it was delicious. We will definitely return. This is the one restaurant we repeatedly return to every time we vacation in P.V. The food, and service is consistently excellent! The menu, service and ambiance are all superb. The owner Andres is always on hand making sure that his customers are satisfied. This is one of those places you go for an anniversary, birthday, or to get brownie points from your mate. The attention to detail was outstanding, from the decor to the presentation of the food. Service is world class, and for a second you´ll feel like royalty. The dishes are plentiful and have a comfortable home cooked flavour to them. Delicious food and wonderful, friendly service. One of the highlights of our trip! International fare has become quite the trend in Puerto Vallarta's restaurant community, and Cafe Maximilian on Olas Altas is exceptional. We have never eaten dinner at Maximilian Cafe, but always have dessert at their sidewalk cafe. They have the best coffee in PV. How's the food? I thought we would eat tacos and burritos every night. Wrong! It turns out that Puerto Vallarta has some of the best restaurants in the world... If you go to Vallarta, make sure you eat at Kaiser Maximilian... We ate like kings, and meals there were like going out to dine in Europe. This Valentine's Day, treat your loved one to a night of wining and dining at Kaiser Maximilian, in the heart of the Puerto Vallarta Romantic Zone. In addition to your choice of innovative dishes from a four-course menu, the restaurant offers an extensive selection of fine wines. Though best-known for serving Puerto Vallarta residents and visitors exceptional Austrian fare, Kaiser Maximilian invites you to dive into the special 'Oysters and More' menu, which is being served, along with the restaurant's regular menu, through February 2nd. Kaiser Maximilian Restaurant in the Puerto Vallarta Romantic Zone will celebrate Christmas on December 24 with a four-course dinner that's sure to make your holidays bright. The European bistro atmosphere and attentive staff will only add to the festive experience. Kaiser Maximilian has been participating in the Vallarta Gourmet Festival every year and, in this 24th edition, they're hosting guest chefs from France who, along with the restaurant's talented team of chefs, are cooking up a 'French Connection' menu that's being served through December 15. Though Kaiser Maximilian Restaurant is best-known for serving Puerto Vallarta residents and visitors exceptional Austrian fare, from November 13 through 22 this charming European-style café is celebrating American Thanksgiving with some special a la carte menu items. With around 6 million visitors from all around the world converging on Munich in October every year, Oktoberfest is the largest festival in the world. In Puerto Vallarta, you can enjoy authentic German food and spirits - without the crowds - at Kaiser Maximilian Restaurant. Food is always an important part of Mexican celebrations so, to commemorate Las Fiestas Patrias, one of Vallarta's favorite restaurants, Kaiser Maximilian, is serving a special dinner menu featuring traditional Mexican dishes with an elegant twist throughout the month of September. Kaiser Maximilian owner Andreas Rupprechter loves Mexico so much that he's not waiting until September to start celebrating El Mes de la Patria. Chile en Nogada, the Mexican dish that is most emblematic of the holiday, is already on the menu at this popular Puerto Vallarta restaurant. Kaiser Maximilian is celebrating 23 years as one of the city's finest restaurants so, in addition to participating in Vallarta Restaurant Week 2018, which runs through June 10th, they'll be serving their special $466 peso, three-course menu for lunch and dinner through June 14th. Taking Mom out for a delicious meal that she doesn't have to cook is one of the best ways to show Mom your appreciation, so make plans now to pamper your Mom during the extended Mother's Day celebration at Kaiser Maximilian Restaurant in Puerto Vallarta's Romantic Zone. Are you spending Valentine's Day in Puerto Vallarta? You can celebrate this sweetheart of a holiday with a romantic dinner at Kaiser Maximilian. Executive Chef Juan Carlos Palomer has created a tempting special a la carte menu with some wonderful selections especially for the occasion. Puerto Vallarta is getting ready for CarnavalPV, the city's annual Mardi Gras celebration, on Fat Tuesday. Kaiser Maximilian Restaurant is right on the parade route and you can have a front row seat while enjoying a special three-course meal with choices for each course. Kaiser Maximilian Restaurant's prime location, right in the middle of Olas Altas street, makes it the perfect place to spend an unforgettable New Year's in Puerto Vallarta! A spectacular five course meal and a DJ mixing some of the best dance music in town make it a truly festive experience. It is a special time of year to be shared with family and friends. Celebrate Christmas Eve and enjoy a sumptuous feast with your loved ones at Kaiser Maximilian Restaurant. The European bistro atmosphere and attentive staff will only add to the festive experience.